For weeks during my junior year of high school, my friend Jennie and I would hang out during the final period of the day in an empty classroom and watch movies while waiting for her brother to drive us home. We'd laugh continuously at 'Liar, Liar' and daydream about Wesley in 'The Princess Bride'. 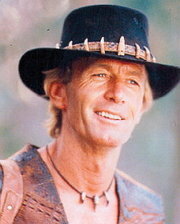 But our absolute favorite movie, the one we repeated more than all the others, was 1986's 'Crocodile Dundee'. Paul Hogan may have been ancient, but is dark,wrinkled, leathery skin didn't deter us. We lived for his smile, sat on the edge of our seats during the scene in which he saves the lady reporter's life. In fact, when he stabbed his bowie knife into the crown of the giant croc's head and twisted it to unleash a sickening sound effect, we almost cheered. To say the least, I remember this movie fondly. Naturally I Netflixed it. Jon, you see, had never been fortunate enough to watch the film on his own. As with everything else in our lives, I wanted to share the experience of 'Crocodile Dundee' with him. I wanted him to feel the nostalgia of the mid-eighties haircuts and flashy clothing styles. I wanted him to be mesmerized by Dundee's Aboriginal tricks. You cannot imagine my disappointment. The dialog was terrible (perhaps because Paul Hogan helped to write the screenplay?) and the plotline was contrived. The love scenes I had sighed over, both in the outback and in the New York subway station, were the ultimate in cheese. Jon, bless him, didn't even roll his eyes. I was writhing with embarrassment at the poor acting and the ridiculous jokes and the unnecessary sexuality. Only one familiar element rang true to me. Dundee is a man. He is strong and focused and unyielding and capable. He wrestles crocodiles and strangles snakes and defends helpless kangaroos. He beats up bullies and dances with ladies and treats everyone as his close friend. I think the woman in me was just awakening when I watched 'Crocodile Dundee' for the first time. While I'd been playing with boys all my life, and then progressed to playing the game of pre-love for the boys, I'd never known attraction to anything more than a sense of humor, an athletic streak, a floppy hairstyle and a torn pair of jeans. At one point, the terrible actress in the movie has survived a mugging after Dundee comes to the rescue with (again) his knife. She crosses her arms over her chest, supposedly the picture of modern feminism, and says, 'I always feel safe when I'm with you, Dundee. Why do you always make me feel like Jane in a Tarzan movie?' He doesn't answer. It is the only way he knows. Of course they kiss then. The music ruins it. But I understand what she means. There's something to feeling like Jane, even in a world where young women are told they need to be the Tarzan for themselves. Climb mountains, girls. Be the CEO of a major, multi-national corporation. Win the Nobel prize. Ask guys for their phone numbers. Forget to call. Opt to drive. Open your own door and pull on your own coat. Hire someone to clean and cook and watch your children; you have more important things to do. But do I really? When Jon and I hiked Half Dome together for the first time, I crawled to the top of that blasted rock with my legs vibrating with fear and my sweaty palms sliding down the steel cables. I dragged myself up to impress Jonathan and to prove I could do it myself. He put his arm around me, proud, and took a picture. But I could barely stand up, and the wind was whistling morbidly all around me. Everything I knew and had known was telling me to excuse myself politely and descend on my own, just the way I'd come up, guts and pride and ability. Thankfully, my body went on strike and I had to tell my brain to take a hike. Jonathan stood behind me on mountainside, strong arms wrapped around me, and held me up. I took one step at a time, using his feet to steady my own. It took ages, but we made it down. Just Tarzan and Jane in Yosemite. There really is something to it. And that's what called out to me from behind the veneer of the lousy 80s flick. Biceps and a big smile, a bowie knife in the backcountry. Just a man who knows what he wants. Even the terrible dialog was redeemed slightly be the always-invigorating Aussie accent.